These are so good and quite easy to make.... the kids can even help. I usually double the batch for parties. 1.Allow dough to rise according to direction on the package. 3.Flatten risen roll in your palm. Add piece of cheese, 3-5 pepperoni, 1-2 banana pepper rings. 5.Place fold side down on greased cookie sheet. 6.Bake 8 minutes. 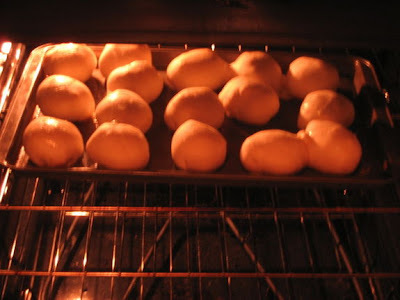 Open oven and brush the tops with melted butter. Bake 12 more minutes or until brown. *These can also be made minus the pepper rings. These look and sound delicious. And the best part is how easy they are to make.